During the spring of 2019, the Prison Education Program is hosting an exhibition showcasing the work of students from oregon’s prisons. The show is on view through June in the Erb Memorial Union’s Adell McMillan Gallery - located at 1395 University St on the University of Oregon campus. The work in this exhibition emergesfrom a space of interiority. Quite literally, the work passes out through the gates of the two Oregon correctional facilities where it was created into the outside world. Likewise, each piece flows forth from the internal experiences of the artist who created it – who is incarcerated in one of these facilities. 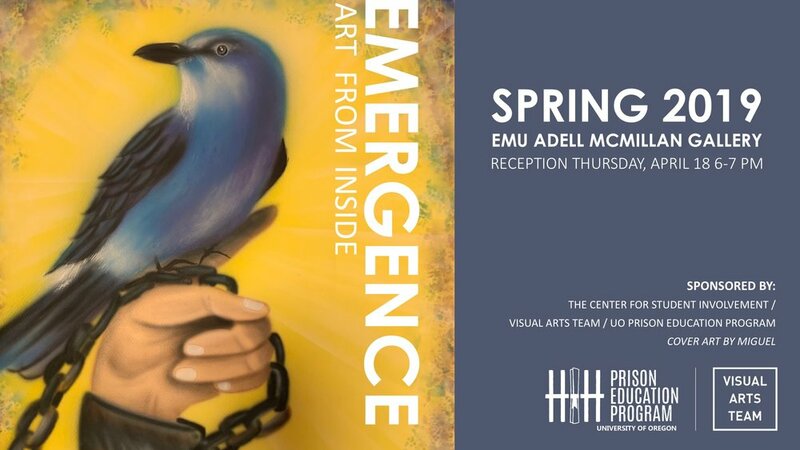 Emergence features work by twenty artists incarcerated at Oregon State Penitentiary and Oregon State Correctional Institution – both in Salem, Oregon – and youth from the Serbu Youth Detention Center in Eugene. The exhibition is a collaboration between the UO Prison Education Program and the Visual Arts Team. In biology, quantum physics and systems theory, emergenceis understood to characterize movement or action in which a whole is greater than the sum of its parts. Emergent theory follows the line of thinking that one individual change can prompt larger change. Many of the artists in this exhibition note the potential which art making holds in their lives as a space of reflection and development. Moreover, they note that the positivity which can come from creating art inspires them to face challenges in their lives. A common thread across the works presented in this exhibition is the emergentpotential which art making has – brushstroke by brushstroke, line by line, piece by piece – to change an individual’s life trajectory, in this case while incarcerated. Style, subject and formal strategy also emerge as through lines across the work. Despite showcasing pieces by over twenty artists created at two separate correctional facilities, representations of the natural world, portraiture, and reflections on culture emerge as axes along which the work is clustered. Emergent theory considers the ways in which a complex wholes emerge from simple parts. While the works in this exhibition are far from simple, together they flow as a cogent and complex whole despite being created and collected without definitive thematic guidelines. The exhibition itself is emergent in that its works organize themselves together into a complex whole greater than their individual sum. The goal of bringing these pieces together is to offer a venue for the work and talent of incarcerated artists to emergeinto a space of higher education. Likewise, to offer a glimpse into the common threads and variations that emerge across work being created inside, with an opportunity for incarcerated artists to describe what art making means to them.